Enjoy the essence of this Twain Harte beauty. 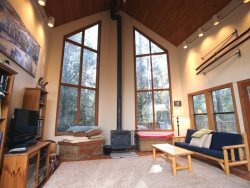 This is the perfect all season vacation rental, conveniently located to town and a spirited jaunt to our lake. Easy access but parking is limited. You will enter into he main level of the house to find the living room, dining room (seating for ten) and the fully stocked kitchen, 1 bedroom with a King and a full bathroom. Downstairs you will enjoy an abundant Family Room with a regulation Pool Table (wet bar and fridge), a full bath, the second bedroom with a Queen bed and the laundry room. On the top floor you can find an open Loft area with a trundle bed, the 3rd bedroom (small but mighty) with five Single beds, a full bathroom and the 4th bedroom with a Double and two Single beds.